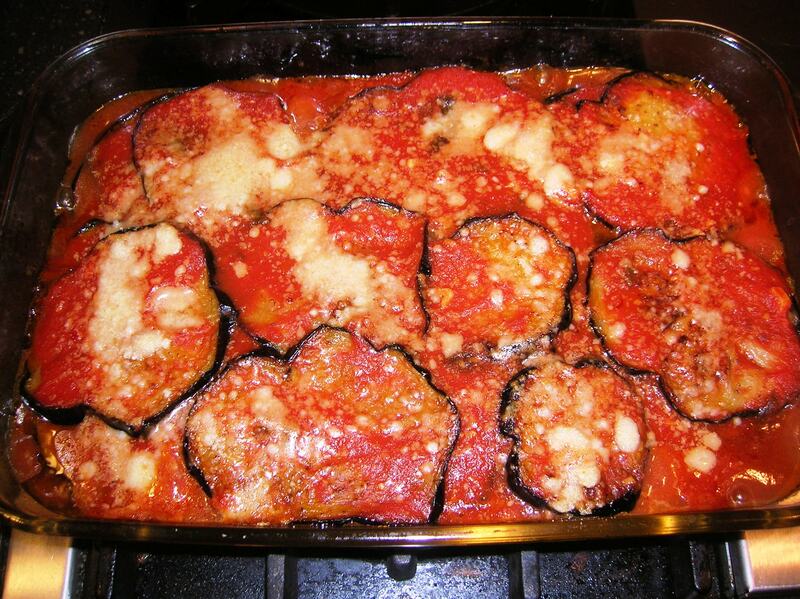 The way my grandmother made eggplant parmigiana is noting like you get today. First she never breaded the eggplant. Second she did not use mozzarella cheese. No mozzarella cheese??? How can it be eggplant parmigiana without mozzarella cheese? If it were called eggplant mozzarella than I can see you asking that. But it’s called eggplant parmigiana for a reason, because it should be made with plenty of Parmigiana cheese. Americans added Mozzarella cheese to this dish, along with anything else they call “Parmigiana”. So this is a true eggplant Parmigiana the way my grandmother made it many years ago. It’s simple, authentic and very delicious. My mother remembers my grandmother making this when she was a little girl and always raved about it. The taste of the eggplant really comes out without being hidden by all that breading. The secret to this dish is fresh ingredients and use a good Parmigiano Reggiano cheese. Wash and slice the eggplant into 1/4 inch rounds. Lightly sprinkle each side with salt and lay in a colander. Place a plate on top of the eggplant with a weight on top and allow to drain for at least an hour. Wipe off the moisture on each eggplant with a paper towel. Heat a large skillet with an inch of oil and fry the slices till golden brown on each side. Add more oil as needed. Place the cooked eggplant on a plate lined with paper towels to absorb the oil. 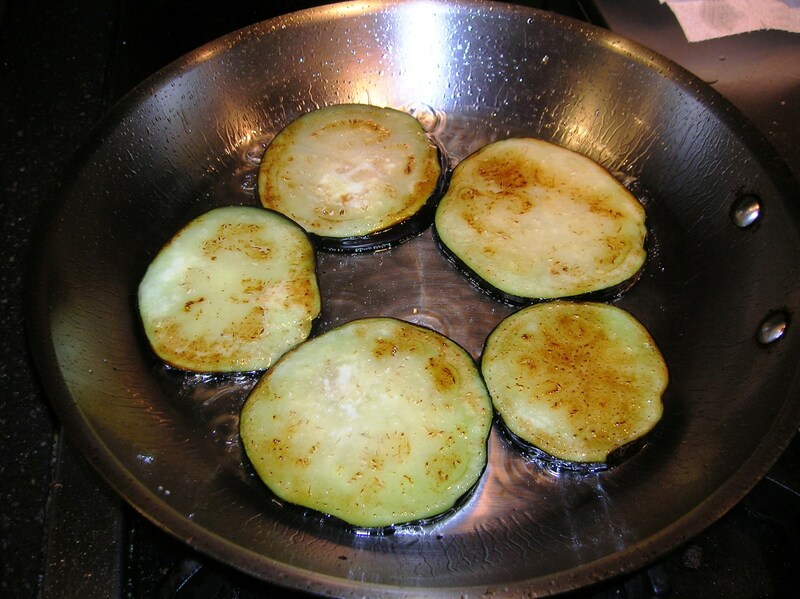 Place a layer of paper towel between each layer of eggplant to get as much oil out as possible. 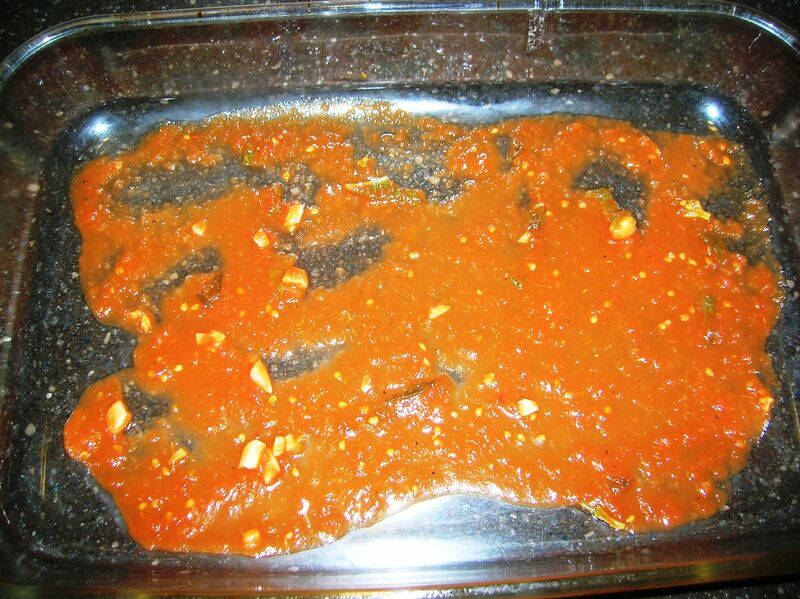 In a large sauce pan heat the two tablespoon of olive oil and saute the garlic for a minute or two. 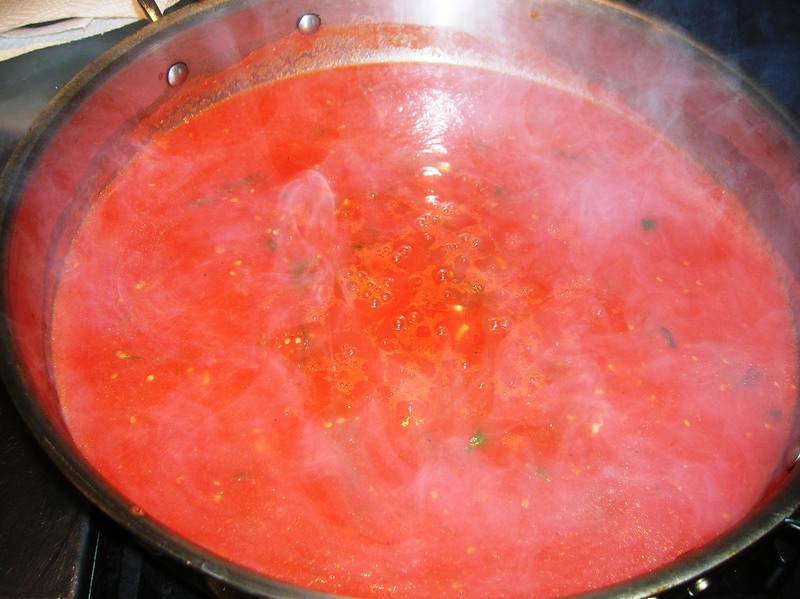 Puree the can of peeled tomatoes and add to the pan. Add basil, oregano, sugar, salt and pepper (use less salt than you normally would) and simmer for about 15-20 minutes or until thickened. Make sure you have plenty of Italian bread for this. 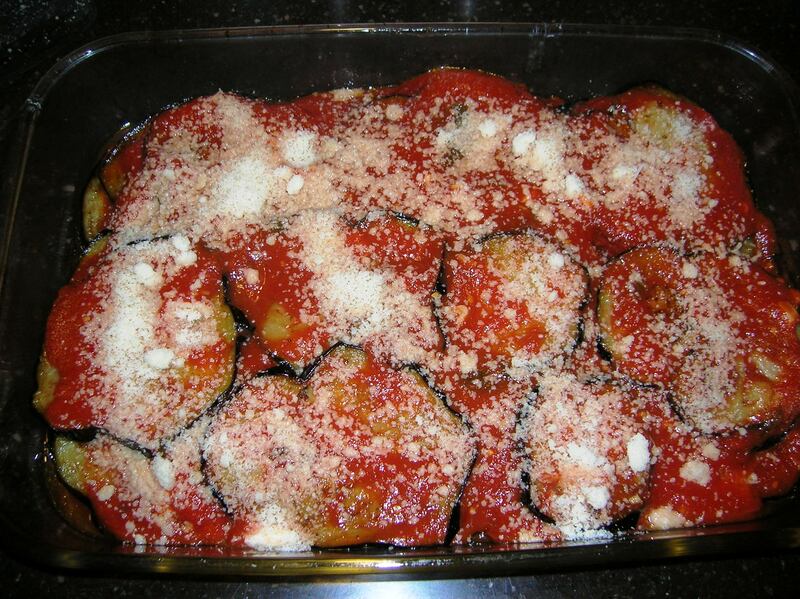 This entry was posted in vegetable and tagged eggplant, eggplant parmigiana. Bookmark the permalink. This dish was absolutely wonderful and even the people who said they were not eggplant fans love it also!! Make sure you have lots of bread!!!! Peter….. Just strolling through you site… and came across this one that escaped me back then. MOMMA MIA….. (and I spell Momma this way) this is the way I ate and still eat eggplant parmigiana today. My mother’s family always made it this way… and I never knew there was another way until I met my mother-in-law. She breaded it… layers with mozzarrella…etc..etc. I like it… but my all time favorite is just like your Grandma’s…. my mother’s family eggplant. Hope you Mom is better. My shingles are gone…. I mean the second bout of them …. GONE ! Sixty and older… get those vaccinations for Shingles. Happy New Year Louise! Hope it’s a good and healthy one. PA is treating me well, I have some new recipes to share, just need the time to do it. Soon. All the best! I”m glad you enjoyed it Niamh, it’s one of my favorite dishes as well. Barbara, thanks for your comments. I hear City Island has some great seafood restaurants. That’s on my bucket list! Like the other readers, this is the eggplant the way my mother used to make it. I still remember as a kid coming in the kitchen and seeing her colander with a towel over it and a bowling ball on top! I knew that meant we’d be having her eggplant! I kick myself all the time for not learning it from her before she died 30 years a go. I loved it so much that on the morning after she made it, I would have a cold sandwich of it for breakfast! I tell people about it and they would look at me weirdly when I would say – no breading, no mozzarella – but I am so happy to see this recipe of yours! I am going to go out now and get the ingredients and make it for my family. Thank you so much!!!!! Sherri, there is nothing better than left over cold eggplant the next day. I would eat it for breakfast, lunch and dinner! Hope the recipe is true to how your mother made it. That’s the way my grandmother did. This is way too greasy! 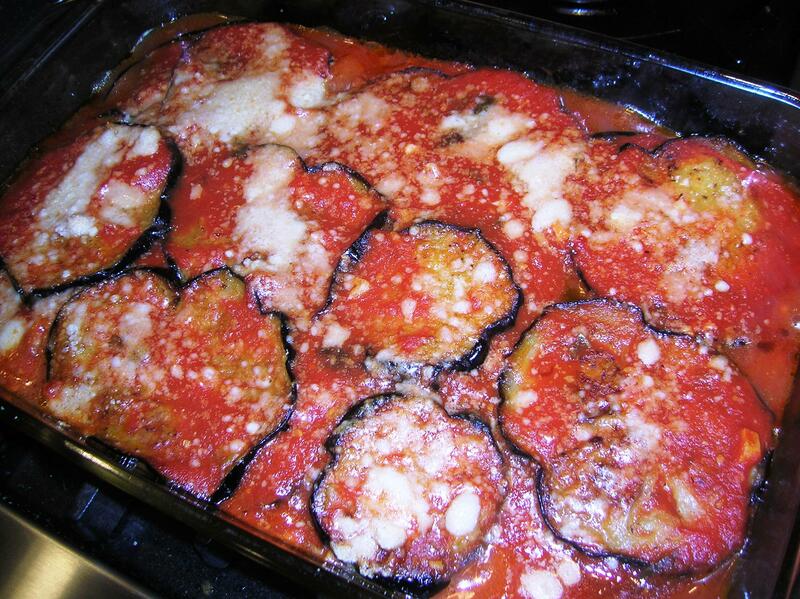 Linda, If you find this too greasy for you try baking the eggplant. Eggplants are like sponges and absorb oil. After they are fried, if they are not placed on paper towels to absorb some of the oil it can be greasy. If you bake the eggplant it will solve your problem. Pre-heat the oven to 400 degrees. Place the sliced eggplant on a sheet pan in a single layer. 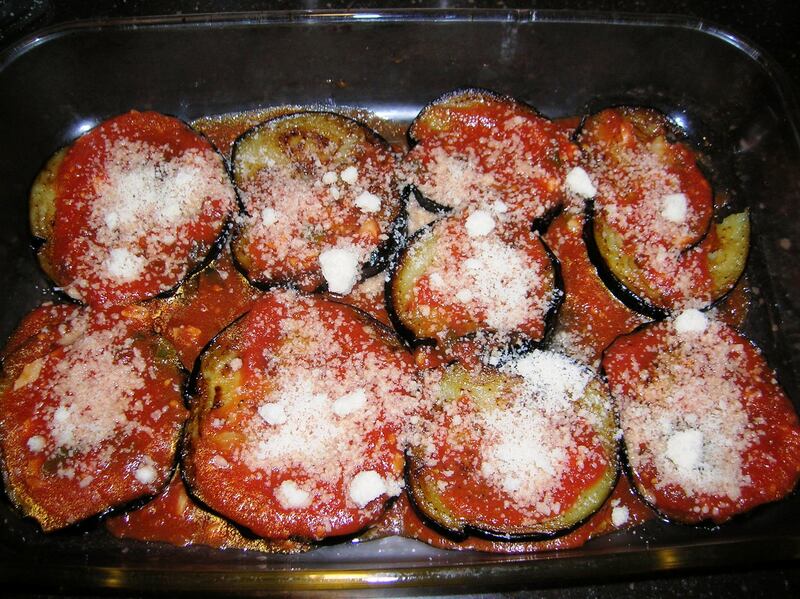 Brush both sides of the sliced eggplant with olive oil, cover tightly with foil and bake 10-15 minutes. Proceed with the rest of the recipe. I love your site. I am also Sicilian and your recipes are almost identical to what I grew up on. Most I cook but some recipes have been lost as grandparents passed away. I am enjoying compiling these recipes for my children so our traditions remain. Thank you for your stories as they bring back many memories! Thanks Karen. Traditions are important.